It's never a bad idea to start out a new year with a few extra good karma points... you never know when you'll need them. So, instead of spending New Year's Eve drinking too much in a crowded, overpriced bar in Seoul, I decided to ring it in at Golgulsa, a Buddhist temple located just outside Gyeongju, South Korea. Templestays have been gaining popularity amongst tourists and usually involve a short-term stay in one of the 900 traditional Buddhist temples in Korea. Participants follow a rather strict schedule to experience a day (or two or three) in the life of the monks that reside there. A templestay was something that had been on my bucket list for a while, so when I found a special New Year's program on the official Templestay website, I knew I had to sign up. It was about a five hour trek from Seoul to Golgulsa Temple that required two bus trips, a bit of waiting around, and a short walk to the temple grounds from the final bus stop. Once I had arrived, I was given a brief introduction to the program, a map of the complex, and special clothes that I was to wear during my stay. I was then directed to my room where I would be spending the night with about fifteen other women. The room was a rather large common area with pillows and blankets spread out on the floor for sleeping. There was a bathroom with a toilet, a few open showers, and sinks that were to be shared. I've become use to this arrangement after living in Korea for a few years but wondered how other Westerners not used to copious amounts of nakedness would handle the situation. CISK note: this guest post comes to you courtesy of T Paul Buzan, who has a lot more stories and pictures available at koreaconnection.net. Life in Korea is a high-octane rush of work and play, late nights and early mornings, and routine adventure. It’s exciting – and frequently exhausting. No wonder caffeine is a staple of most diets here. But there’s only so much coffee and green tea a person can drink. At some point you have to slow down, breathe, and take a few minutes to just chill out and recharge. Where to go? 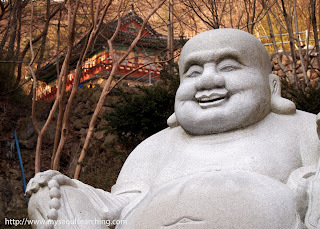 One of the most peaceful experiences you can have in Korea is visiting a Buddhist temple. Imagine: Beautiful, natural scenery; the air sweet with the smell of incense; the rhythmic chanting of monks. It’s the perfect antidote to a hectic weekend in Seoul. Ready to plan a relaxing trip? 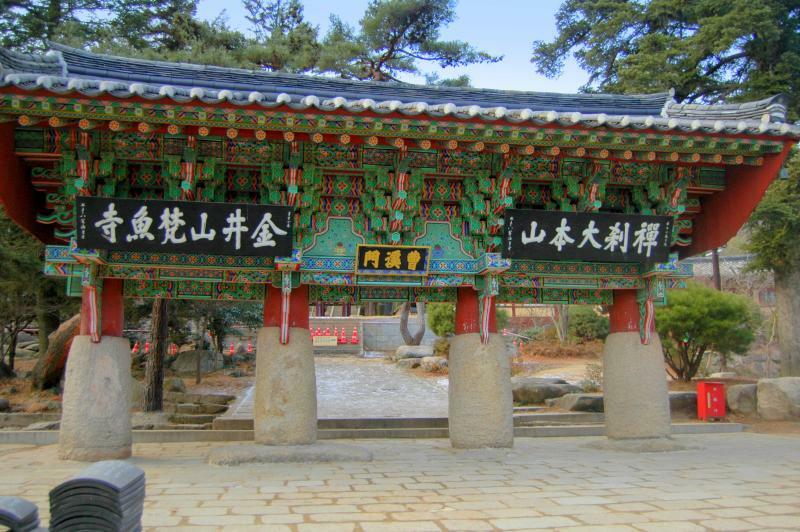 Read on to learn about one of the more unique temples Korea has to offer. The largest Buddhist temple in Busan, Beomeosa feels both homey and solemn, if such a thing is possible. Enter through the storied gates and become aware of the temple’s 1,300 year history. The monks were everywhere. One was beating his wooden moktok, another was laboriously carrying a load of plants, and a third was walking through the courtyard. 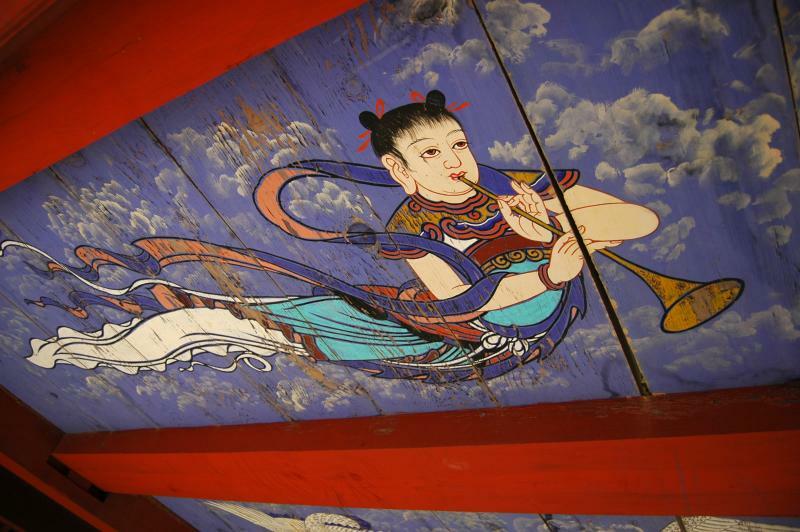 A number were meditating behind one of the hall’s closed doors, while even more were seen walking in a separate section of the temple, restricted to visitors. One was even seen bringing a Dunkin’ Donuts bag into the monks-only section. At that point, the Lady in Red pinched me, telling me that this is indeed not a dream – there really are lots of monks here. Then again, why wouldn’t they be? 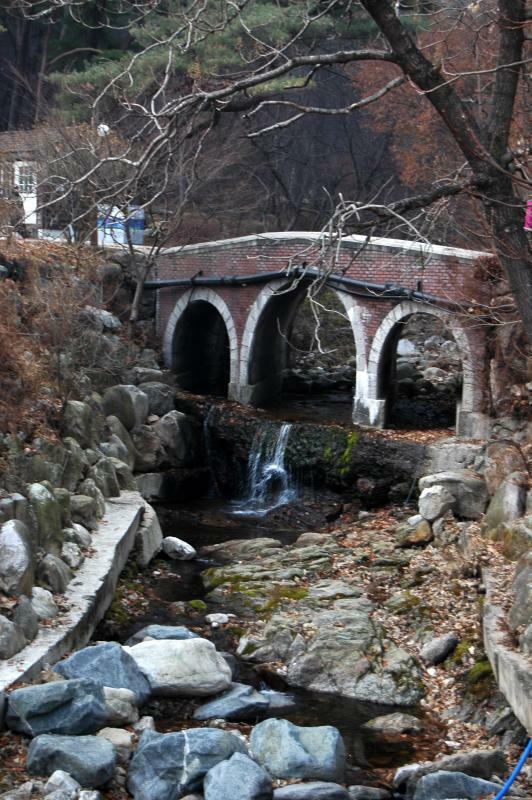 Not to be confused with the surrounding Yongmunsan Resort (용문산관광지), Yongmunsa offers a thousand-year-old tree just outside of a temple founded as the Silla dynasty was ending. It seems a bit disingenuous to put an amusement park right next to a Buddhist temple, but there it is.